After more than 1,200 collisions in the past three years, city officials decided to trim lanes and speed limits along the busy, narrow route. Nationally, road diets reduce crashes some 29 percent, while a city study of Seattle’s 2007 road diet on largely commercial Stone Way North found injury crashes dropped by a third. Average speeds dropped 3 mph. The trade-off is delay, which the city guesses will be up to two minutes per driving trip through the project area. Some commuters will likely divert to Martin Luther King Jr. Way. The seventh building crash happened Feb. 27, through the front door of Rainier Beauty Supplies, at Rainier and South Orcas Street. 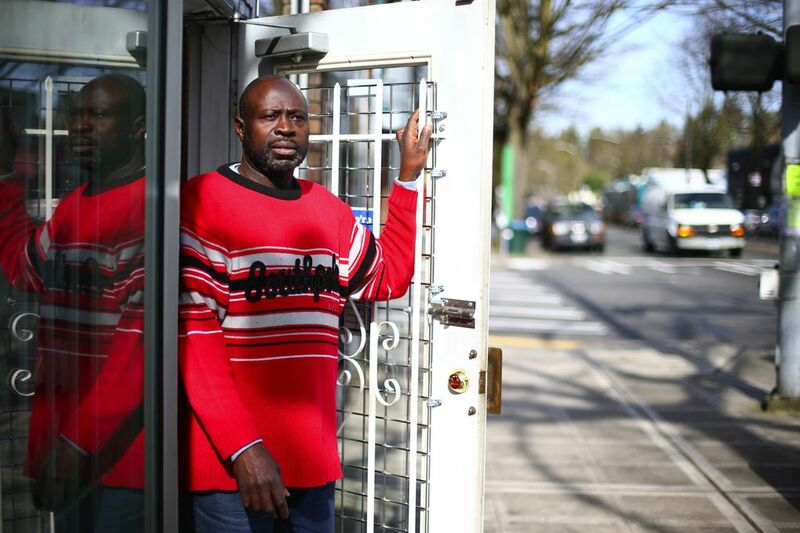 The owner, Samba Ceesay, was upstairs doing paperwork, while his wife worked the shop floor. Vehicle collisions with buildings are a national problem, at about 60 per day, said Rob Reiter, whose research is endorsed by the Texas Transportation Institute. Two-thirds happen in parking lots, one-third along streets. “There are a lot of Rainier Avenues all over the country,” Reiter said. The old downtown of Las Vegas and famed Colorado Boulevard in Pasadena, Calif., site of the Rose Parade, have made similar changes. “By dropping the speed limit to 25 mph, you can reduce crashes,” Reiter said. 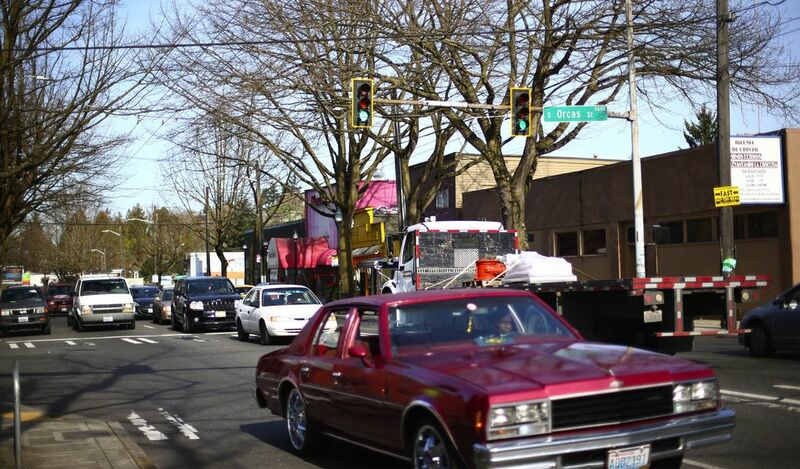 Rainier Avenue South carries about 19,700 vehicles per day through the Columbia City and Hillman City business areas. That’s among the busiest streets here to go on a road diet, along with West Nickerson Street five years ago. The idea of reducing lanes on Rainier dates back at least to a neighborhood plan written in 1999. However, it was only in recent years that traffic declined 30 percent — as transit ridership grew — making the road suitable for fewer lanes, said city project manager Jim Curtin. The Route 7 bus carries 11,000 riders a day, while new restaurants and cafes bring walk-in customers. “They all have to cross a street at least once,” Curtin said. The project falls under Seattle’s new Vision Zero policy, meant to eliminate road deaths and serious injuries by 2030. A core value is low speed. People have a 90 percent chance of surviving a 20-mph impact, but only a 10 percent chance at 40 mph, Kubly emphasized. It’s also a test of Mayor Ed Murray’s Move Seattle initiative, when he declared not every mode of travel will be served by every street. Bus and bike lanes are being considered for the area, but there isn’t room for both, and building either would displace the merchants’ curbside parking. Rainier therefore will require difficult trade-offs. As for traffic congestion, City Councilmember Bruce Harrell, who has lived near Rainier Avenue for more than 40 years, makes an intriguing argument: Crashes block the roadway, so if low speeds reduce them, people might actually spend less time per year stuck in traffic. Besides speed, a huge safety threat is left turns, where a car abruptly stops, and waits for an opening to go left on a solid green light. A turning driver often can’t see all the oncoming traffic. A central left-turn lane, with green arrows at Orcas and a few other spots, will help, Curtin said. Curtin said new left-turn lanes could make the road more efficient, because traffic need no longer stop behind left-turning cars. Paved islands, already common in Wallingford, would deter drivers from zipping through the center turn lane. And the city has grants for 250 extra enforcement hours this year and next, he said. 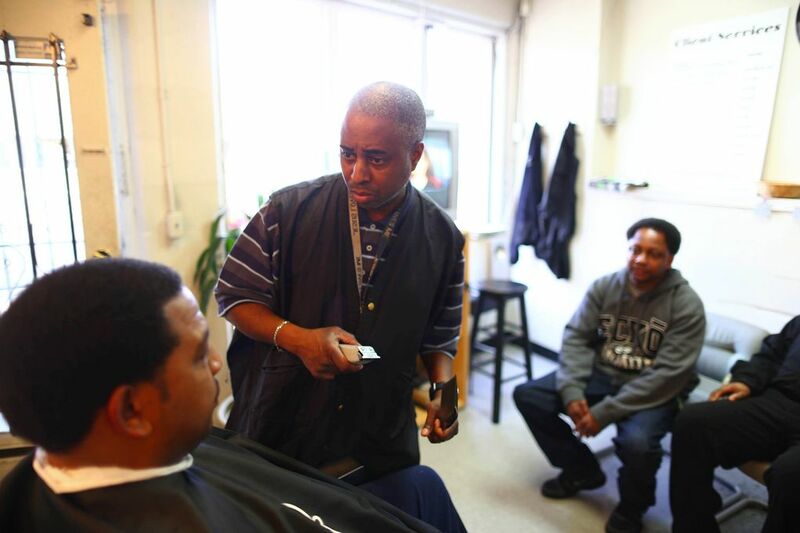 Stalin Harrison Jr., who owns a barber shop, said he would welcome a 25-mph speed limit, and plenty of traffic police. “It has helped in the school zones,” he said. On the other hand, Harrison said 80 percent of his customers drive, so he’s wary of taking away two general lanes. If commuters switch to MLK Way, that adds east-west traffic to other neighborhoods. South Henderson Street, which connects Rainier to MLK, offers only two lanes, right alongside South Shore K-8 school. South Othello and South Alaska streets were road-dieted to encourage pedestrians. On MLK itself, the community has longstanding worries about kids and seniors crossing the broad roadway and Sound Transit tracks. “We’re very sensitive to that. We’re very mindful of the fact the little girl Zeytuna was hit on MLK,” Curtin said. Zeytuna Edo, age 7, was injured in a hit-and-run crash crossing the street in September, near Rainier Vista, a year after Trevon Crease-Holden, 15, was hit nearby. The city’s answer? Calm the traffic on MLK Way. Long ago when it was Empire Way, cars would routinely go 50 mph, while the speed limit now is 35 mph, matching the federally approved speed of Sound Transit trains in the median. The city is studying signal changes, pavement markings, and narrower lanes there. At the valley’s north end, where MLK and Rainier converge, safety studies are under way to improve pedestrian crossings near Franklin High School and Mount Baker Station, said Curtin. By the end of this year, he said, drivers are sure to see a new 30-mph speed limit on MLK.